That is the greatest discovery of the last thirty to fifty years – the discovery of ourselves, our true motives, our real assumptions. No longer do we live in a world where the naturalistic, atheistic view of life is taken for granted. No longer can anyone merely assume that God is not there. The “predisposition against the supernatural” has been exposed to scientific scrutiny and found wanting. Atheists are becoming agnostics and many have become theists, biblical theists, embracing the God of the Bible. Science is thinking more clearly, discerning between science itself, and the philosophy, and even theology, of the scientist. In addition, a basic distinction is now maintained between “origin science” relating to theories on the origins of the universe and biological life, and “operational science” relating to the study of ongoing processes and the methods and procedures used in dealing with observable and repeatable events. Allan Sandage, winner of the Crafoord prize in astronomy (equivalent to the Nobel prize), remarked, “I find it quite improbable that such order came out of chaos. There has to be some organizing principle. God to me is a mystery but is the explanation for the miracle of existence, why there is something instead of nothing. Up to this point, believers can only be pleased that God has seen fit to reveal the scientist to himself. But there is still a question for us to consider. Leaving aside the scientific evidence for a moment, how does this all square with the Biblical witness to the creation of the world. This particular discussion is an internal one, specific to those who believe that the personal God revealed in the Bible is also the transcendent creator-being who began the cosmos. Frankly, many Christians have not always seen the Big Bang Theory in such a positive light believing (wrongly, it seems) that billions of years would still allow for an evolution of life along the lines of Darwinism. Others want nothing to do with any scientifically based theories (or even evidence) on the origins of life and hold fast to a literal understanding of creation in six days by the God of the Bible. The question is whether or not you can have both. The debate within Christian circles is often spoken of in terms of theistic evolution versus young earth creationism, but there is a middle position to consider as well called Progressive Creationism. God created the universe and directly created the first living form. He established the process of evolution. In this view, mutations and natural selection are God’s method for producing His creation. God created matter in such a way that it has to evolve. However, God also has had involvement in the evolutionary process at specific times, intervening to modify the process. God created the first human being by using an already existing being (one of the higher primates) and giving it a human soul. God created the universe and all that is in it through direct action. This happened over a very short period of time, perhaps a calendar week. God did not use any indirect means or biological mechanisms to bring His creation into being, but used direct action or contact. In each of His acts of creation, God created the universe initially out of nothing (Gen. 1:1). From the universe he formed human beings and other parts of creation. Each species was created distinct from all others. God made man completely by a direct creative act and then created a woman also. Already you can see that the main difference is whether the emphasis is put on a literal reading of the biblical revelation first of all or on the scientific evidence (which is not conclusive on the issue of the origin of man). The main issues seem to revolve around the age of the universe, recent or billions of years (but no longer infinite), the age of our world, recent or in terms of a few billion years old, as well as the process of creation as evolutionary or with direct theistic involvement or some combination of both. Science supports the age of the universe in terms of around 14 billion years old, the world in terms of 4.5 billion years old and a combination of evolutionary and direct “out of nothing” creation events in the process of a long creation period. That would mean either theistic evolution (with supporters such as C.S. Lewis, Howard Van Till and Pierre Tielhard de Chardin) or progressive creationism (Norman L. Geisler, Robert C. Newman, and Charles Lyell) would fit the scientific evidence best. God created the universe and all that is in it directly. However, He did this at several points in time, separated by large time spans. When He brought new life forms into existence, He did not use existing matter; He created each from nothing. However, between these acts of creation, development took place within the species through the process of evolution (microevolution). God made man directly and completely. Although other Christian theories (such as Local Creation Theory, Day-Age Theory, Gap Theory and Pictorial Day Theory) of how to integrate the Biblical revelation with the new scientific evidence also exist, these three (Theistic Evolution, Progressive Creationism and Young Earth Creationism) are the most popular among Christians today. But do not fall into the trap of thinking that the Young Earth Creationist view lacks scientific backing. The second law of thermodynamics is often cited as evidence that the universe is decaying at a rate that only allows for thousands not billions of years. In addition the decay of the earth’s magnetic field also supports that view. There are also arguments from astronomy and geology as well as arguments against radiometric dating (carbon 14 dating). Other scientists would disagree of course. There is even the possibility of a recent creation of an “old” universe (Ideal-Time Theory). How else could God create the world? Adam was a certain age when he was created and his body must have some evidence of a “history” (with or without a bellybutton). In the same way, the stars could have been created recently, together with all of the light particles necessary between the stars and earth so that we could see them. How do you create a “young” mountain or a “young” tree, unless it is a seed? Everything must have been created at some point in the process of aging and development. Rocks must have layers and trees must have had rings. There were some seedlings, some young saplings, some mature trees and some ancient oaks. This view would allow for an “old” earth, created recently, with fossil records of plant life and dinosaurs that may never have existed but are there as part of a necessary “backstory” to the creation of the earth. But some see that as a question of integrity for God. Would that fit the character of God as we have come to know Him through the Bible, that He would leave evidences in the fossil records that may, in fact, lead many in the wrong direction with regards to the question of the origin of the universe and the beginnings of life. Putting this into historical perspective, this “misleading” evidence in the fossil record has only come to light recently, over the past one hundred years or so. Therefore, it is only a problem for the modern age. Even so, it would not appear to be an issue of integrity but rather of the practicalities of creating life (and the earth itself) with a “history.” God is under no obligation to provide a scientific rationale for the manner in which he decided to create the world. There is no doubt that science has done wonderful work in providing a rationale for believing that the personal God of the Bible is the transcendent creator-being that “caused” the universe. As a scientific apologetic it is helpful in an age still dominated by rational atheism but there is a point at which the shoe must go on the other foot, so to speak. If we believe that the transcendent creator-being has revealed himself through his actions and message recorded in the Bible, then, logically, that revelation has stronger weight and clearer evidence for the creation event than any other source and must take priority over the scientific “evidence” (which, after all, is by nature partial and incomplete). This is a new and startling source of information that must be given priority of place in so far as it speaks to the issue at hand. The real debate then is to decide what the Bible says, scientifically and theologically, and then, if possible, to make the scientific evidence fit that body of information. In any event, these are the questions that Christians are asking in the wake of the amazing recent advancements of our understanding of the origins of life. There is a basic commitment by all Christians to the view that special revelation in scripture and the general revelation of nature are fully compatible even if our understanding of that compatibility is not complete. Whether a person opts for theistic evolution, progressive creation or a young earth (or recent “old” earth) creationism, the landscape has radically changed and all three positions stand firmly against a rational atheistic and naturalistic position that no longer has the full weight of scientific evidence in their favor. The concept of creation ex nihilo (“out of nothing”) has now been validated for the universe as a whole, as well as for the DNA/RNA necessary for specific life forms (including humans) to come into existence. Christianity is based on a creation ex nihilo by the personal God revealed in the Bible and there is now reasonable evidence to suggest that creation ex nihilo is the only scientific explanation available that fits the observable facts. Scientific creationism (and, to a degree, theistic evolution but with certain reserves) has now become the new language of Christian belief in creation. Footnotes and references included in original manuscript. The point? “What do you mean?” I said. “Is that possible?” he said. I shifted nervously in my seat. “I’m not sure what you mean,” I said. 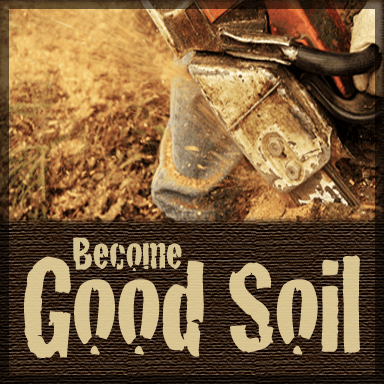 Click here to read more……. A Conversation with God by Bert A. Amsing. Used with permission. 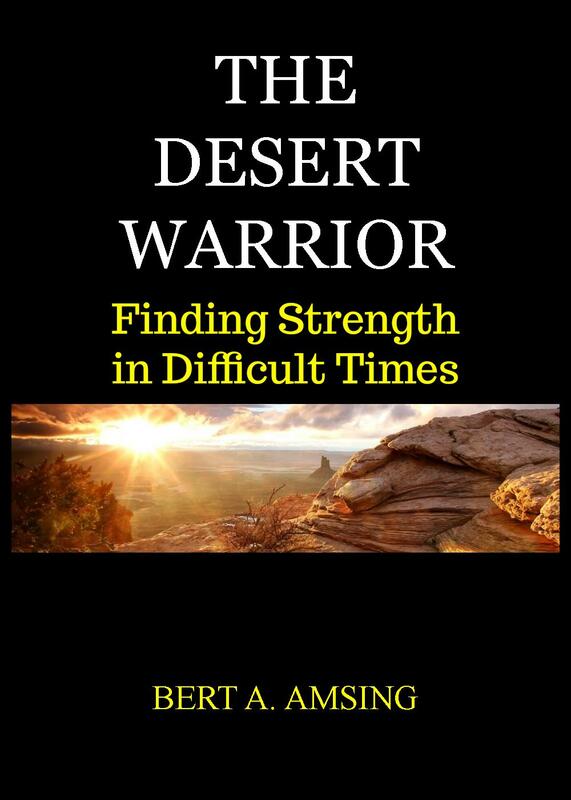 Excerpt from Tears of the Desert Warrior by Bert A. Amsing. If the remarkable coincidences that make up the parameters or context for life on our world are amazing, the actual development of life is infinitely more so. The discussion on the parameters for life fundamentally assumes that if life is to exist (which it obviously does) there are necessary ingredients and processes that the world and the universe must have to sustain that life. Now we take a further step and ask how life itself began, given the incredible context of “remarkable coincidences” that make sustaining life possible. Did some unknown, transcendent being (not confined to time or space) start the universe and then leave life to come into being through natural processes? Can Darwinian evolutionism be saved by the Anthropic Principle with only a minimal deistic acknowledgement of the transcendent? Apparently not. For the universe and the solar system we noted some characteristics that must be fine tuned to better than one part in 10(37) for life to be possible. But, the fine tunings necessary to build an independent, functioning organism require precision crafting such as people have never before imagined, precision to one part in a number so big that it would fill thousands of books to write out. The first problem that biologists face, when it comes to the origin of life, is the issue of the time scale. There simply isn’t enough time available “for natural processes to perform the necessary assembly.” Life is recent and unexpected on earth despite conditions that would sustain that life. In fact, some of the very atmospheric conditions that are necessary to sustain life are not the right conditions necessary for life to develop naturally without any intelligent intervention. It isn’t just the development of a basic living entity from non-living building blocks (as difficult, if not impossible, as that may be), but also the assembly of those basic living entities into a living organism. The incredible amount of specific information contained in every living cell and the vast array of options that need to be decided for the step-by-step construction of each cell are far beyond anything that Mr. Darwin could imagine in his time, long before the advent of molecular biology. Lee Strobel puts the issue of the origin of life into a succinct summary that is hard to refute. Darwinism can offer no credible theory for how life could have emerged naturally from nonliving chemicals. Earth’s early atmosphere would have blocked the development of the building blocks of life, and assembling even the most primitive living matter would be so outrageously difficult that it absolutely could not have been the product of unguided or random processes. On the contrary, the vast amount of specific information contained inside every living cell – encoded in the four-letter chemical alphabet of DNA – strongly confirms the existence of an Intelligent Designer who was behind the miraculous creation of life. No one doubts that there is some form of microevolution within a species but the basis for a macro-evolutionary origin to human life is at odds with the strong evidence for intelligent design in the creation of living organisms. The necessity for a DNA/RNA source for the development and assembly of any living organism and the obvious unavailability of such a key piece of the puzzle begs for a supernatural origin from the same transcendent being who both created the universe out of nothing and did so in such a way as to support and sustain human life. The “creation” of human DNA/RNA strands by an intelligent being is a necessary and logical condition for the existence of human life on our planet. Of course, one could argue that, in light of the available information, it is best to remain agnostic and wait for more details to surface or for another explanation of the origins of life to come to light. Perhaps in the context of scientific debate, that agnosticism would be the most intellectually honest approach, but in the context of life in general, many scientists and atheists are having a difficult time maintaining their former positivism and/or absolutism for a naturalistic explanation of the world. God has made his presence known – scientifically. The darkness was so complete that I didn’t dare move. “Hey, I don’t know. I just got here. My name is Charles.” Reaching out, groping, finally touching with arms outstretched. “Well, all I can remember is…..” I stopped. A jumble of memories collided in my mind like a train wreck. “Well, I was driving home from work. The roads were icy. I can’t remember anything else.” Something was nagging at me, a persistent thought that, for some reason, I wasn’t too eager to pursue. “Maybe we’re in the hospital,” I said. “Maybe we had an accident and we’re in a coma or something.” That couldn’t be right. I felt around my face for bandages. Nothing. “Well, I’m not cold so we can’t be outside,” I said. “I think you were right about the accident thing.” I didn’t like saying it out loud, but it was the only logical explanation. Charles Benton. Neighbor. by Bert A. Amsing. Used with permission. “It sounds depressing,” he said. “What’s the next question?” he asked, turning to look at me. One of the assumptions of the last two and a half centuries has been that the universe was infinite in size and that it always existed. That has now been shown to be incorrect. Our generation has discovered how to measure the cosmos and probe the deepest mysteries of the universe. The other assumption made by the Kantian worldview is that the basic building blocks of life have always been available and that the universe, and our world specifically, had enough time to allow random chance to assemble those building blocks in such a way as to naturally cause life to develop. There are two sets of evidence that have come to light that make this assumption fail. On the one hand, the relatively recent origin of the universe, measured in billions rather than trillions of years, does not leave enough time for random chance to function even if the right ingredients for life were readily available. On the other hand, molecular science, as well as astronomy and physics, has discovered a complex world of molecules, atoms, nucleons and electrons that are so finely tuned that even a small variation in a complex web of parameters would make life impossible in our universe (or on our earth). Lee Strobel makes the comment that “In the past thirty-five years, scientists have been stunned to discover how life in the universe is astoundingly balanced on a razor’s edge.” This idea that the universe “possesses narrowly defined characteristics that permit the possibility of a habitat for humans” is called the Anthropic Principle. Of course, it could just be coincidence but the statistical level of possibility (blind chance) is so astronomical that it is patently difficult to quantify it. The popular approach, used by many rational atheists today, is to assume that blind chance has indeed happened since we are here after all. This is, of course, to abandon a rational approach to a naturalistic explanation for the world as it is observed and experienced. A rational approach would attempt to attach all truth statements to the observable reality of our world. A dependence on blind chance to account for the “cause” of the universe is as much a faith statement as a belief in a personal God – without even accounting for the inescapable indications of intelligence, creativity and design. If these “remarkable coincidences” are truly a sign of intelligence, creativity and design with the purpose of supporting life, especially human life, on earth, the obvious question would be –why? And if there is a purpose, there must be a “who” behind that purpose. There can be no intelligence, creativity or design without a personal being to exercise those attributes. But perhaps that is already a step of faith that is beyond most people’s ability to take. Suffice it to say that the burden of proof is now on the other side of the equation and we now live in a post-positivist world in which the minimum expectation for intellectual honesty would be some form of theistic agnosticism. Atheism and all forms of Pantheism and the worldviews depending on them, are now scientifically suspect. Theism, especially biblical theism, fits the scientific evidence most closely and is therefore rational even if not conclusive. That is, to say the least, an interesting place to be. to make this one thing the hallmark of my life. whether I am healed or not. to obtain the pearl of great price. 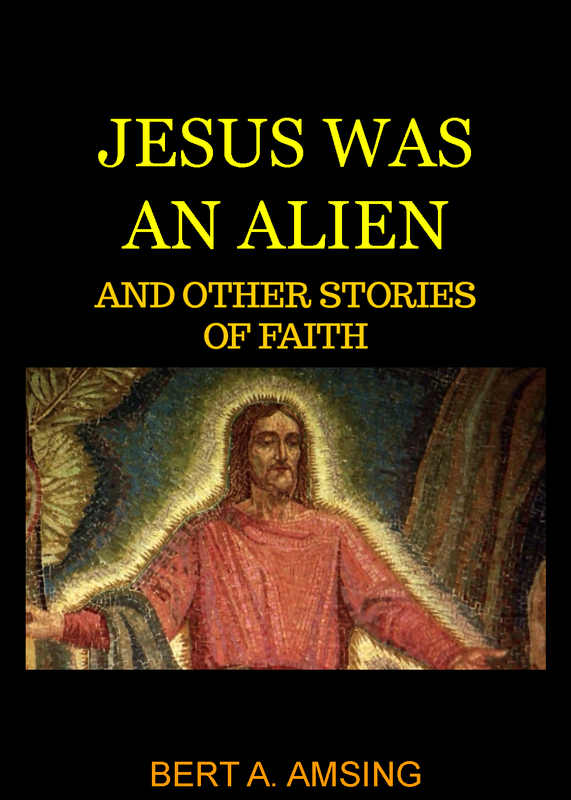 So begins Jesus was an Alien (and Other Stories of Faith). Here you might talk to Jesus about your neighbors and get his perspective. Here you may encounter God in flip flops in a boardroom or discover that Jesus was an alien (or not). Here a funeral can be a wedding and an eight year old can teach you the Heart of God. Watch as El Shaddai, the Almighty God, intervenes at the Tower of Babel. 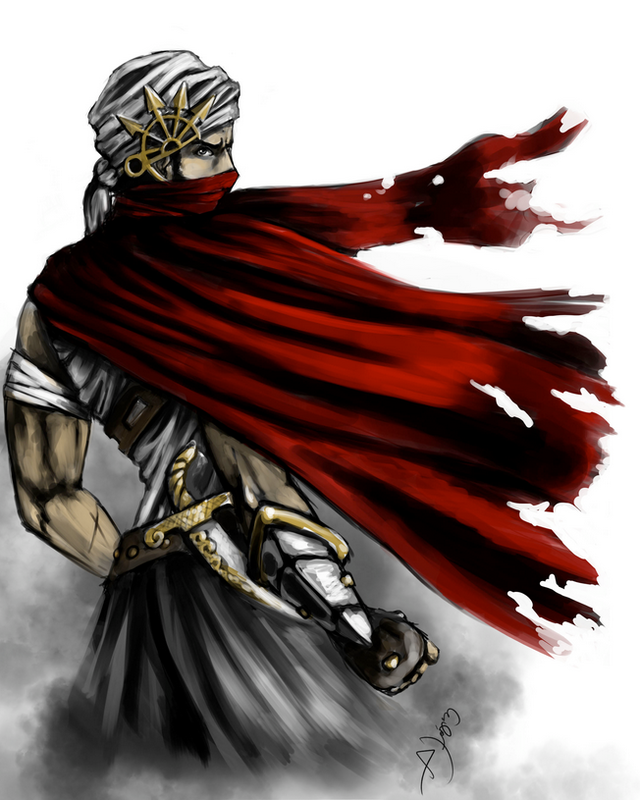 Discover the Way of the Desert Warrior with Joshua at the foot of Mt. Sinai and rejoice in the shock of Lucifer at the cross as Jesus raises his spiritual head and looks upon his enemy in triumph. All this, and more, awaits to inspire your own story of faith. Read. Share. Live. The Divine Story is lived in you and through you. “I think you have something more than traces and clues,” he said. “I don’t think they really know. They are just hoping for some kind of breakthrough,” I said. I shook my head. It was hard to accept. But he was right. His teaching was gentle, but insistent. This is a collection of my favorite stories. Some are taken from other books that I am in the process of writing. Think of them as an introduction. A few have been written only for this collection and others are excerpts from The Temptations of the Cross and The Desert Warrior Series. For some of my readers, these stories of faith may be their first introduction to the crazy, wonderful world of people dedicated to loving and obeying God. You may start with the idea that Jesus was an Alien but, hopefully, you will end up with a deeper appreciation for the God described to us in the Bible. All of it may be hard to believe but why should that surprise you. One of the key aspects of the Big Bang theory is the discovery of eternity. Not everyone would use that language of course, but the facts are still irrefutable. There was nothing and then, there was something. When we say that there was “nothing”, we are stating that energy and matter did not exist. Therefore, space and time did not exist. By space, we refer to the universal experience of height, length and depth – our three dimensional experience. By time, we refer to that dimension in which cause-and-effect take place, in which the laws of physics are at work, and which continues at a set pace and is not reversible. Of course, we are talking about time and space in the real world of observable phenomena and experience. In essence, general relativity theory refers only to matter and energy and postulates that the universe began in an explosion of energy producing matter with the resulting formation of galaxies and planets. Then, in the late 1960´s, came the space-time theorem of general relativity. Astrophysicist Hugh Ross, explains what happened. In a series of papers appearing from 1966 to 1970, three British astrophysicists, Stephen Hawking, George Ellis, and Roger Penrose, extended the solution of the equations of general relativity to include space and time. The result was called the space-time theorem of general relativity. This theorem demonstrated that if general relativity is valid for the universe, then, under very general conditions, space and time must have originated in the same cosmic bang that brought matter and energy into existence. In Hawking´s words, time itself must have a beginning. The validity of the space-time theorem is directly related to the validity of the principles of general relativity as proposed by Einstein. He, himself, proposed tests that would either validate his theories or not. Other tests have been added and much work has been done to validate the theory of general relativity with observational evidence. Tests began within the context of the gravity fields of our solar system and were found to be consistent with Einstein’s theory. But what about further into space? Perhaps general relativity might not apply in much stronger gravitational fields such as a binary pulsar. But, by 1992, these concerns were also laid to rest. The shrinking of errors and the confirmation of multiple tests reduced the possibility of inaccuracy in the general relativity equations practically to nil. If time and space, matter and energy all had a beginning, what started it all? Quantum physicists and particle theory scientists may want to study the dynamics of that initial split second of released energy in what we call the Big Bang, but what about “before”? What was before the Big Bang? What caused the Big Bang? Was it a spontaneous event of chance? How? Even blind chance must have something to work with, some power (energy), some thing (matter), which, if it existed pre-Big Bang, must be outside of our concept and experience of time and space. That is the key to our dilemma. There must be another dimension of time and of space, another source of power (or energy) that can create matter. Whether that source of energy, existing in another dimension of space and time, is a person or simply an amoral, unthinking, force of pre-nature, still needs to be determined. At the same time, that “something” is by definition and in relation to us, transcendent (existing outside of our space-time continuum and not made up of any matter or energy that we are familiar with or that exists in our universe). It can also, logically, be called the “creator” or, if you like, the “causer” (or First Cause) of our universe. Whether this is merely an extra-dimensional “force” or a “personal being” of some sort, can be determined by a study of the incredible precision necessary in the releasing of the energies and forces at the beginning so that life, especially human life, became possible in the universe that was created. The Big Bang was actually a highly ordered event… An infinitesimal difference in the rate of the universe’s initial expansion, the strength of gravity or the weak force, or dozens of other constants and quantities would have created a life-prohibiting rather than a life-sustaining universe. Even Einstein believed in “the presence of a superior reasoning power” present at that initial moment of time. He believed that this transcendent cause was intelligent and creative but not necessarily personal. Not for scientific reasons, as he himself readily admits, but rather because he simply could not accept the personal God of the Bible in a world full of pain, suffering and evil. He could not resolve, philosophically, the paradox of God’s predestination and man’s free choice. However we resolve the secular or religious problem of evil or the paradox of free choice, there seems to be no rational argument to hold that a being who is both intelligent and creative is not also personal. Einstein did not live to see the incredible accumulation of scientific evidence that strongly indicates that the universe was created with the purpose of providing a habitat for human life. Intelligence and care in the initial moments of the universe have been supplemented with incredible design and other, subsequent “out of nothing” creative moments as the universe expanded, as our solar system was formed and, especially, as our planet became populated with life. Creation may have begun with the Big Bang but it did not end there. The out of nothing creational “days” apparently continued until the dawn of human life on earth. In other words, subsequent scientific inquiry has shown that the Big Bang event did not merely set in motion certain “evolutionary” processes that resulted in life the way we experience it today. There were, apparently, other “out of nothing” creative moments that were vital to the development of life as we know it. Footnotes and references included in the original manuscript.